Motorists across Wales have been warned to expect icy conditions over the next two days. A Met Office yellow "be aware" warning for ice is in place until 11:00 GMT Friday. Rain has caused localised flooding in Powys. One motorist had to be rescued from flood water in Welshpool, according to the fire service. The cold spell has led to disruption affecting travel, power supplies and caused hundreds of school closures. 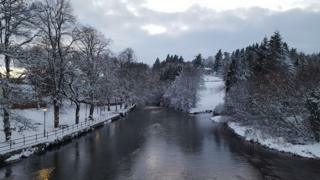 Powys council said its highways staff were removing snow from more remote roads but, with changing weather conditions up until Sunday, its priority would continue to be the main road network.